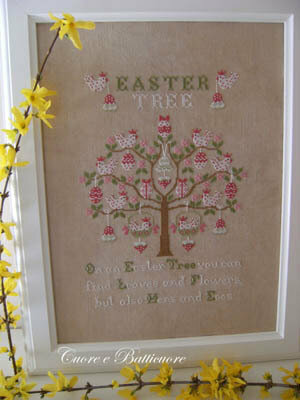 Kit includes 11 Ct. white pre-finished Aida, pattern, floss, needle and instructions. Finished size is 12.8" x 33.6" (32cm x 84cm). Model stitched over two theads on 32 Ct Country French Latte Linen using Gentle Art Sampler threads (or DMC 3325, 729, 676, white, 647, 3364, 369, 3024, 613, 3727, 3774, 434). Stitch count 102x101. Model stitched on fabric of your choice with DMC floss. Color charts. 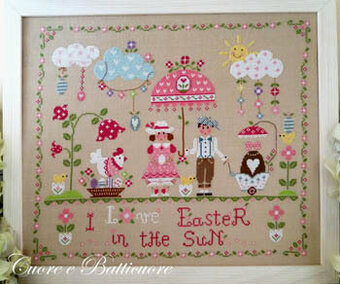 "Easter House" stitch count: 63x97. "15 Sided Biscornu" stitch count: 22W x 22H. Model stitched over two threads on coffee stained linen with DMC floss. Stitch count 136x193. 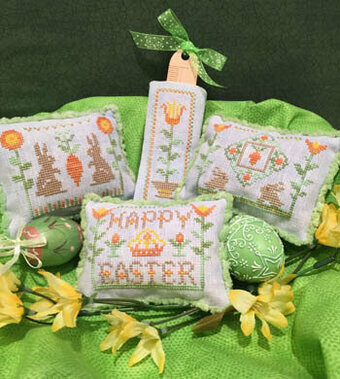 "Happy Easter" Models stitched on 32 Ct. over-dyed light blue linen with Weeks Dye Works and DMC floss (or all DMC 722, 3348, 743, 3782, 3781). Stitch Counts: Pinkeep - 59x37, Ruler Case - 21x61. Pattern only, does not include the Fallbrook House lamb doll (available from the designer). The Pattern is suitable for any 14ct Fabric. Stitch Count 53W x 45H. Model stitched in 32 Ct. Vintage Country Mocha using DMC floss. Stitch count 161x191. 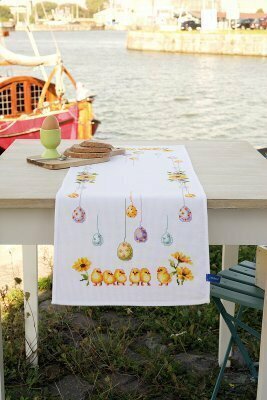 Model stitched on 32 count linen of your choice with Weeks Dye Works thread (or DMC thread 3865 and 3041). Also uses a heart button (included with pattern). Stitch count is 32 x 32.